Figure 1. An Updated Model of RNAi-Mediated Crop Protection from Insect Pests. Insecticidal dsRNAs expressed in planta either undergo processing into small interfering RNAs (siRNAs) or are imported into insect cells upon feeding on the plant, presumably by homologs of the double-stranded RNA (dsRNA) transport protein SID (originally discovered and subsequently characterized in detail in Caenorhabditis elegans ) and/or by endocytosis. Because insects do not possess RNA-dependent RNA polymerases (RdRPs), and therefore silencing signals cannot be amplified in insect cells, the RNAi response in the insect is largely dependent on the input of dsRNA that is taken up from the host plant. Efficient processing of dsRNAs expressed from the plant nuclear genome into siRNAs constrains the RNAi effect on the insect. This obstacle can be overcome by high-level expression of long dsRNAs in plastids (chloroplasts), a double membrane-surrounded cell organelle that lacks an RNAi machinery. Consequently, long dsRNAs produced inside the plastid are protected from cleavage by Dicer enzymes and remain stable. In this way, plastid expression of insecticidal dsRNAs provided complete protection of potato plants against the Colorado potato beetle . 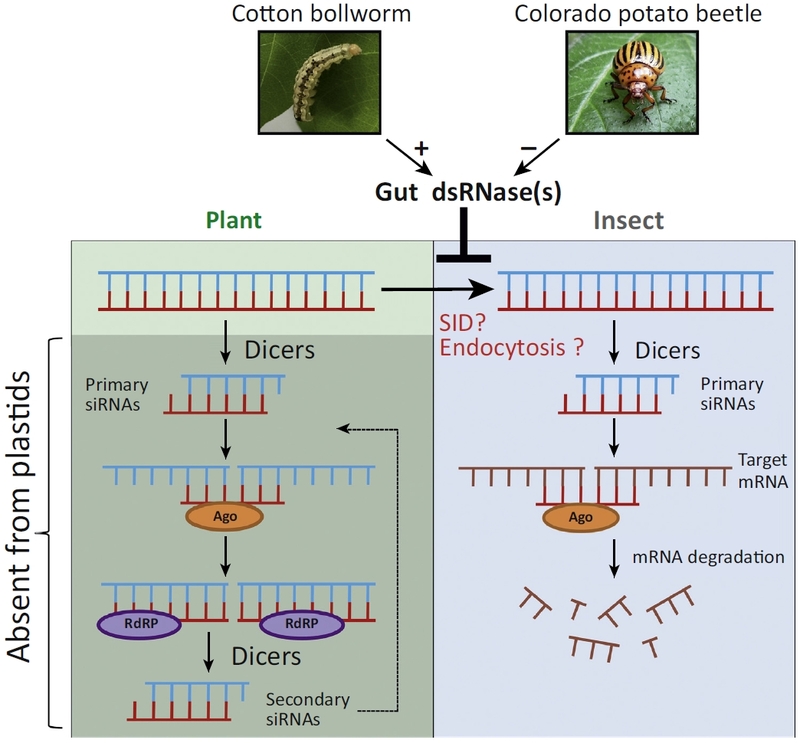 However, dsRNase enzyme(s) present in the midgut of lepidopteran insects, such as the cotton bollworm, may degrade dsRNAs upon release from ingested leaf material and thus impede the RNAi responses. dsRNA-specific ribonuclease(dsRNase): an enzyme, typically an endoribonuclease, that specifically degrades dsRNAs. RNA-dependent RNA polymerase(RdRP): an RNA polymerase capable of using single-stranded RNA as template to synthesize a complementary RNA strand. By catalyzing the replication of RNA, RdRPs can amplify silencing signals generated by dsRNAs. Most of the dsRNA is processed into siRNAs in the plant, which are taken up much less efficiently by insect cells than is long dsRNA. The concentration of insecticidal dsRNA in the plant tissue consumed is particularly important. The length of the dsRNA fragment produced in the plant. The physiology of the insect gut or hemolymph. The choice of the target gene to be silenced in the insect. 1.Luo, J. et al. A transgenic strategy for controlling plant bugs (Adelphocoris suturalis) through expression of double-stranded RNA homologous to fatty acyl-coenzyme A reductase in cotton. New Phytol 215, 1173–1185 (2017). 2.Zhang, J., Khan, S. A., Heckel, D. G. & Bock, R. Next-Generation Insect-Resistant Plants: RNAi-Mediated Crop Protection. Trends in Biotechnology 35, 871–882 (2017).